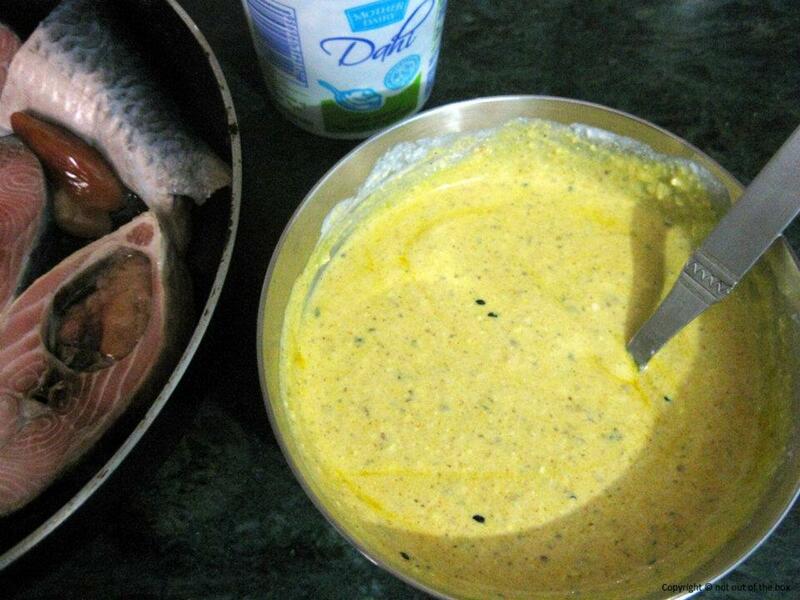 In a bowl add mustard paste, 2 tsp mustard oil, 1 tsp turmeric powder, salt (as per taste), nigella seeds. Mix well and keep it aside. Now whisk the yogurt until smooth and mix it with the mustard mixture. Now take a container which is well fitted into your pressure-cooker (read note). Arrange the freshly washed fish pieces in the box, pour the paste over it, add some water as per your requirement of the gravy (I used 1/4 cup ) and spread 4-5 tbsp of mustard oil on top along with a few slitted green chillies which will add some extra flavour into it. Close the container tightly. Place the container inside the pressure-cooker and pour some water inside of the cooker (the water level should be halfway up to the container). Close the lid. Start heating over medium heat. After two whistles turn off the heat. Wait until the steam inside gets dissipate. Bring out the container carefully and open it. 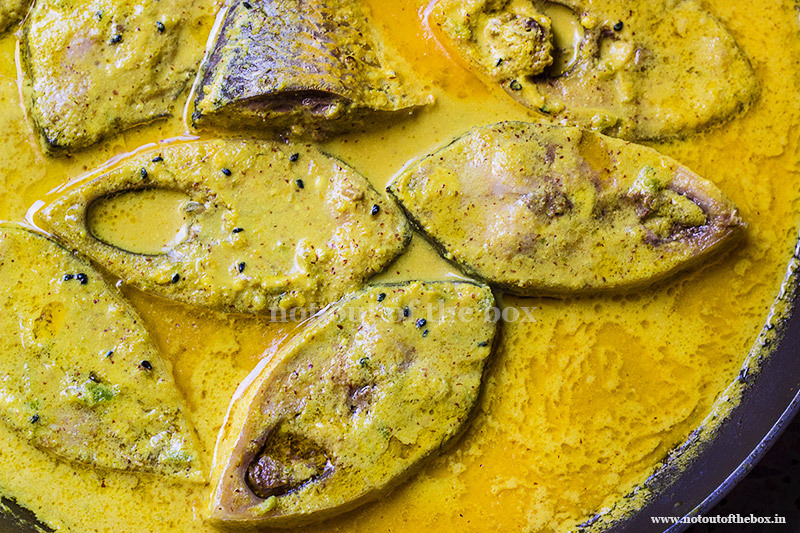 Your Doi Ilish Bhapa is ready to eat, serve hot with steamed rice. Enjoy! 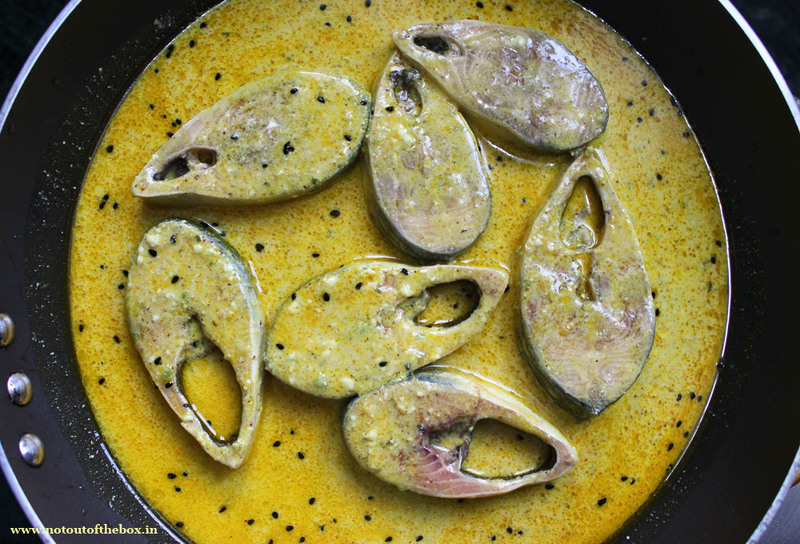 Alternately you can cook Doi Ilish in a Frying pan or Deep frying pan/kadai too. Just put everything in the kadai with a lid on. Cook over low heat for 15 minutes. Remove from the heat, serve hot. 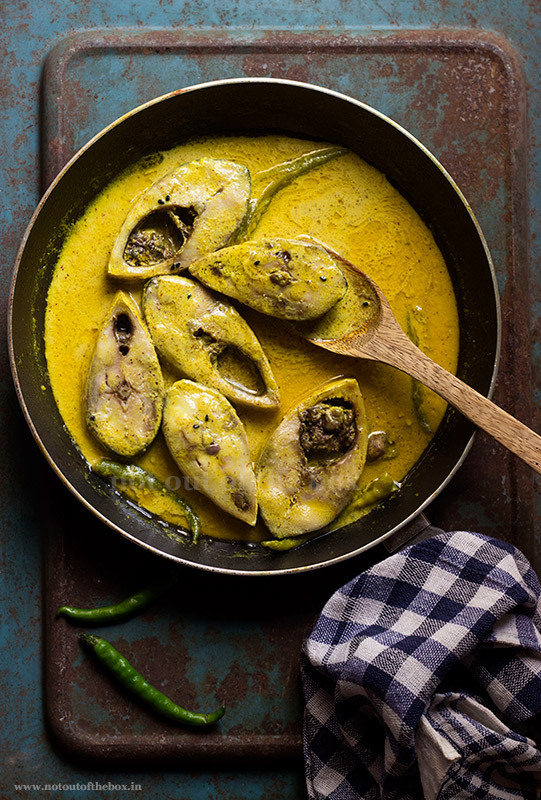 Doi Ilish Bhapa is an age-old Bengali delicacy where Hilsa pieces cooked in a divine Mustard-Yogurt gravy. Easy to cook, serve hot with steamed rice. Now take a container which is well fitted in your pressure-cooker (read note). Arrange the freshly washed fish pieces in the box, pour the paste over it, add some water as per your requirement of the gravy (I used 1/4 cup ) and spread 4-5 tbsp of mustard oil on top along with a few slitted green chillies which will add some extra flavour into it. Close the container tightly. When you say mustard paste, do you mean kasundi? Or a regular off-the-shelf mustard? If kasundi, is it easy to make at home? Hi Meghana, Mustard paste is different from Kasundi. It’s a paste made with mustard seeds and water, then we add it into the curry. I want cook dai ilish. So please send me recepi.